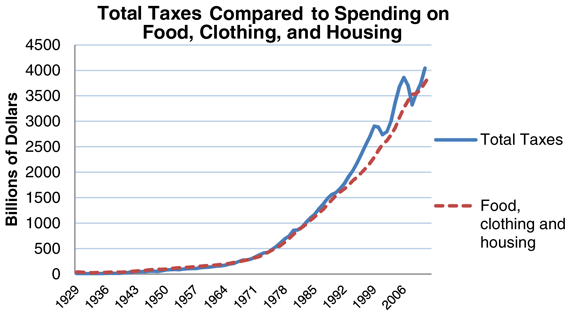 In 2012, Americans will pay approximately $4.041 trillion in taxes, which is $152 billion, or 3.9 percent, more than they will spend on housing, food, and clothing. The Tax Foundation is a nonpartisan tax research group based in Washington, D.C. This entry was posted on Wednesday, May 30th, 2012 at 6:45 am and is filed under Break Room. You can follow any responses to this entry through the RSS 2.0 feed. You can leave a response, or trackback from your own site. Not all Americans……. Only the 40% that are gainfully employed.